Oh dear, it has been a week since I posted. I have a pretty good reason for this though. The school year has begun, and I am once again working. The life of a teacher is busy though, so my updates might become less frequent. I will most likely start posting about once a week with my food truck highlights from the week instead of posting about every single time I eat at a truck. 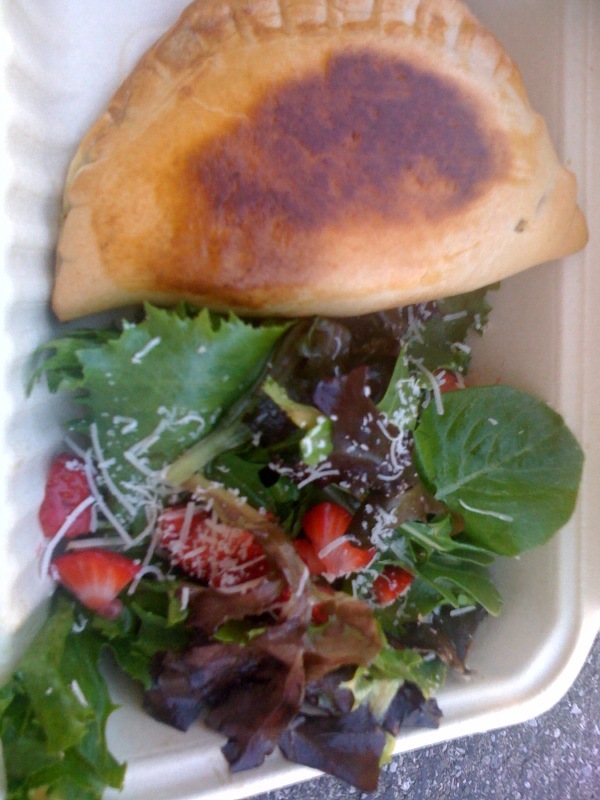 We begin this week’s post with last week’s Edgewood Eats on August 22nd. I went with my mind already made up, determined to eat some banh mi from Little Green Cyclo, but when I arrived I discovered there was a new truck! 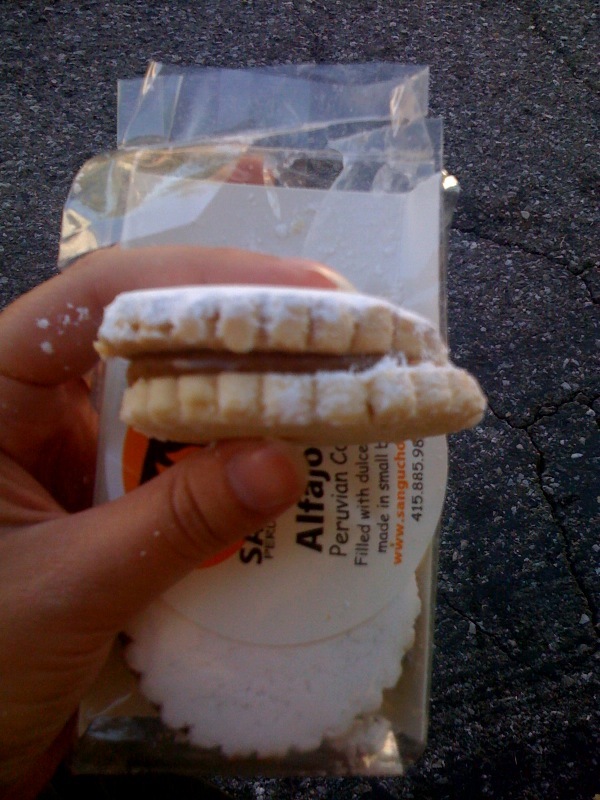 I’m a bit of a sucker for caramel, and the alfajores delivered. 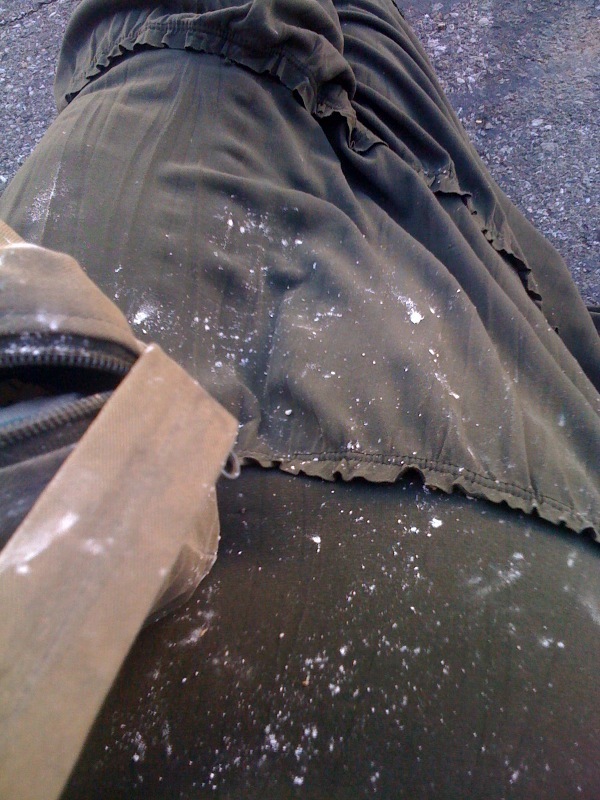 They were also covered in powdered sugar, and by the time I had finished eating them so was I. Luckily, powdered sugar washes out easily! 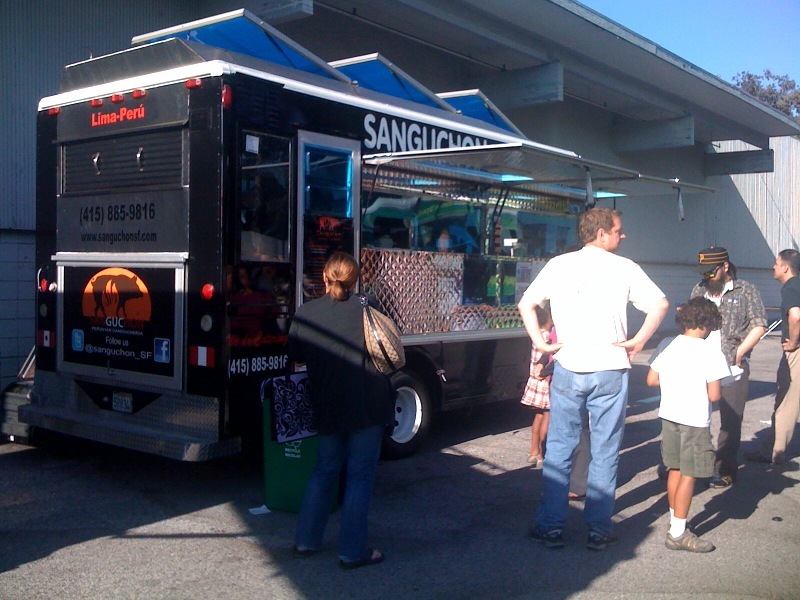 On Saturday the 27th, I headed to Moveable Feast and ran into more new trucks! Tequila Tacos didn’t have any vegetarian options, but Mayo and Mustard did! I had checked their menu ahead of time and saw a veggie sandwich on it. When they only had three sandwiches listed on their chalkboard, all including meat, I was momentarily scared, but they eased my worries when they said they’d serve the rest of their menu too. Phew! I’m really glad they did because the sandwich was delicious. Since I’ve become a vegetarian I’ve discovered that veggie sandwiches are usually awesome because people really pack in the veggies, and they have so many flavors going on at once. 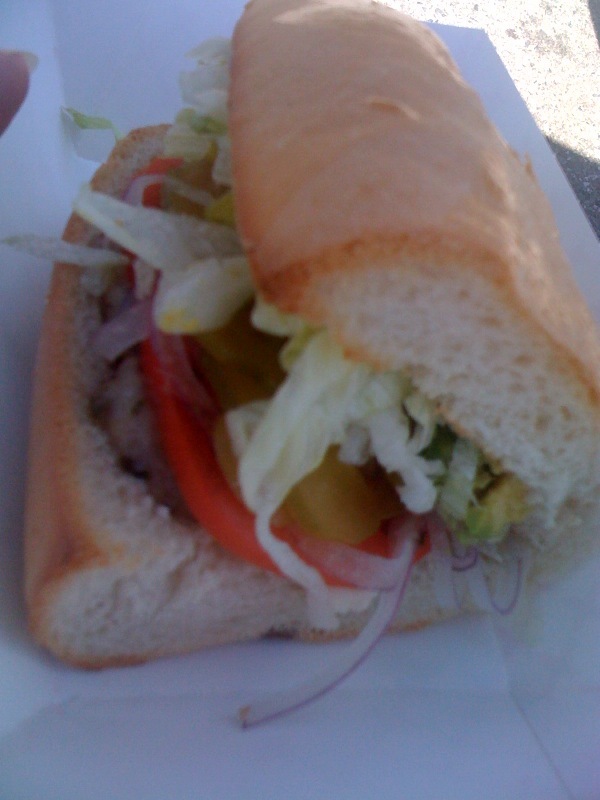 Mayo and Mustard’s sandwich was no exception. 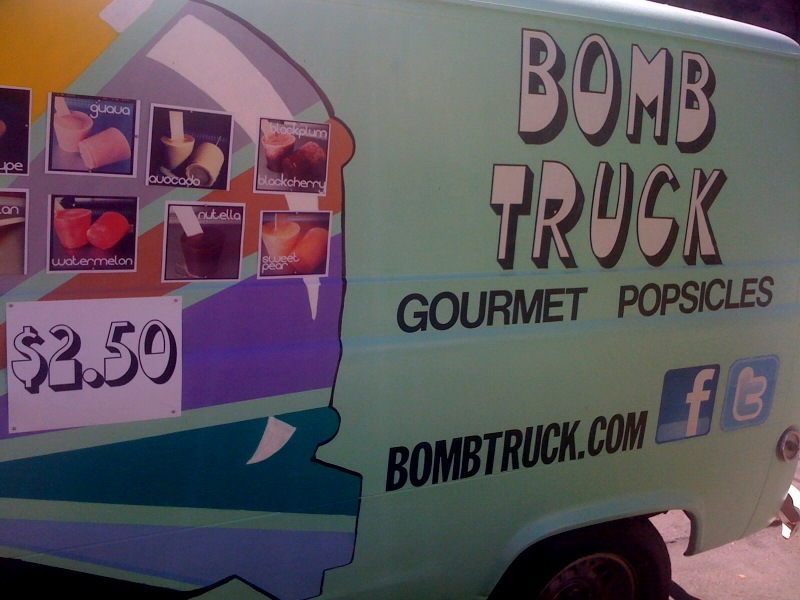 I was also happy to see Bomb Truck at Moveable Feast. They had been spending a lot of time in San Francisco and hadn’t been in San Jose much lately. 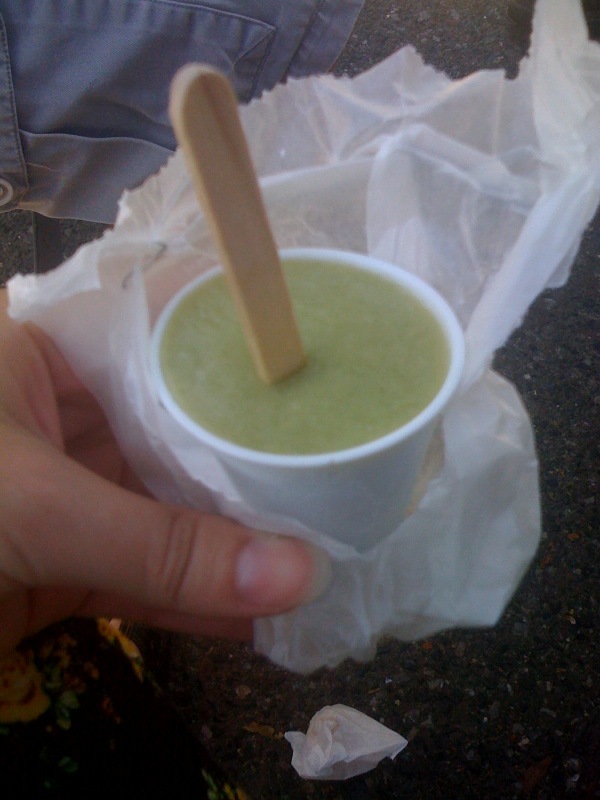 This time I got two popsicles from them, avocado and mango. Of the two, I preferred the mango. The avocado was good, but it didn’t have quite as much flavor. Then again, more flavor would have probably been too much avocado for a popsicle. I think I still enjoyed their nutella flavor from the last time I tried the truck most overall. Yesterday, despite being exhausted after the first day of school, I still ventured over to Edgewood Eats mostly for some butterscotch brownies. Before dessert I needed dinner though, so I went to another truck I hadn’t been to before, although I had seen it at other events. 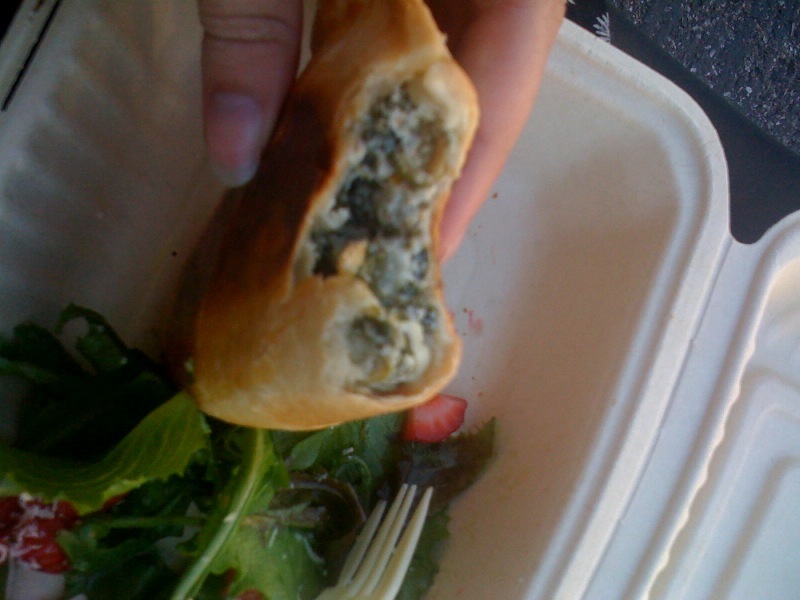 I had previously not spied any vegetarian options on the Whisk on Wheels menu, but this time they had a spinach and ricotta empanada that came with salad. I hope to see this item on their menu again because it definitely hit the spot! 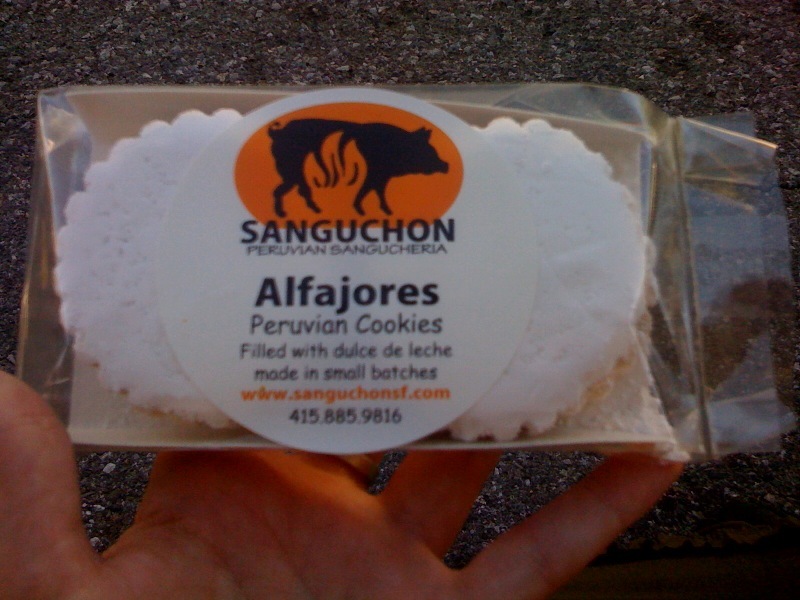 Despite having lots of classroom prep to do this weekend, I still plan on attending both Moveable Feast San Mateo on Friday night and Moveable Feast San Jose on Saturday afternoon. Look early next week for the highlights from those events! I thought I wouldn’t be able to visit any bay area food trucks in the two and a half days I was in town, but I was wrong! On Wednesday, I checked my twitter feed and saw that a new truck, Bomb Truck, was going to be in downtown San Jose. They had just debuted while I was out of town, so I was excited to get a chance to try their popsicles! Being lactose intolerant, my first question was which pops were dairy free. There were only two that weren’t, and with the huge variety I had a difficult time making a decision. Eventually, I went with the nutella flavored pop. 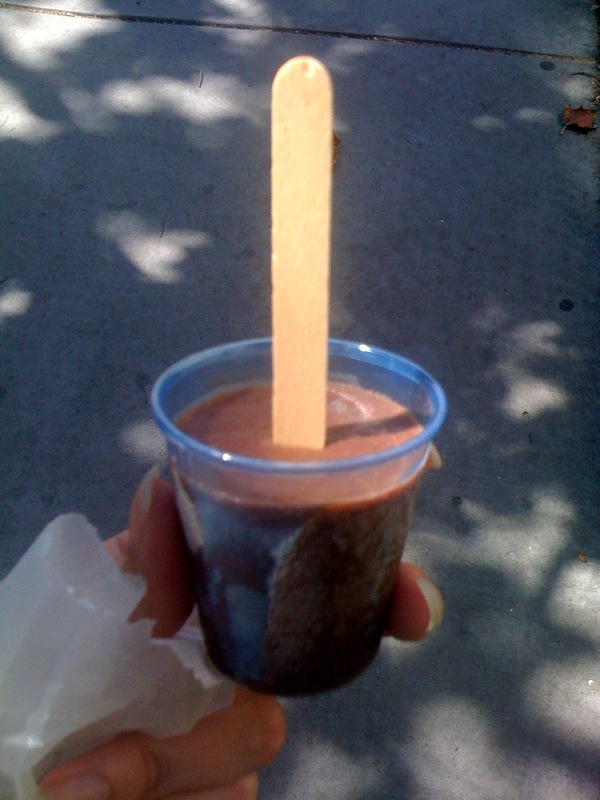 It was tasty, and I enjoyed the addition of the little cup that fit around the popsicle. It made it so I didn’t feel pressured to eat the whole thing before my drive home because I could put it in my cup holder. In fact, I soon regretted not getting more than one popsicle as soon as I realized they were so easily transported. The truck recently tweeted that their pops can even be taken to go with dry ice! 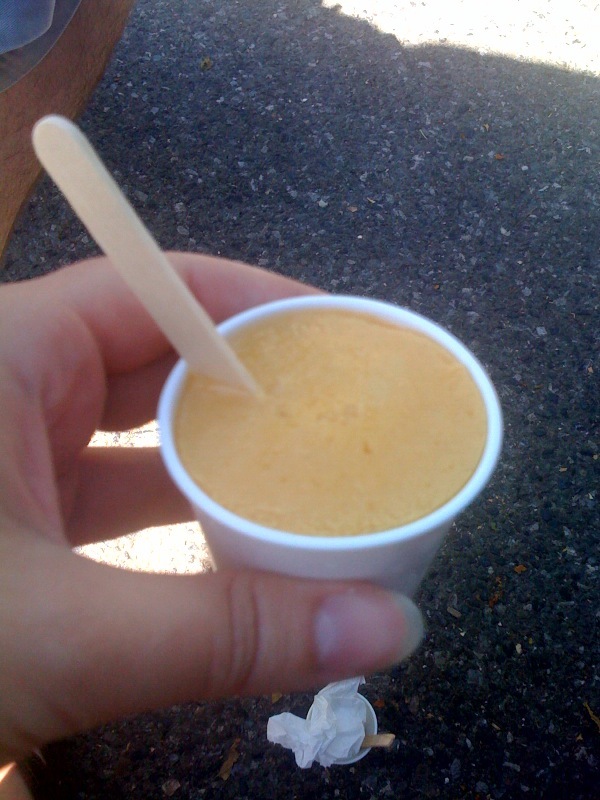 I think my favorite part, though, was the little bit that melted at the bottom of the cup. Sipping it after I was done brought me back to my childhood when drinking the remains of an Otter Pop was the highlight of the whole experience. That evening, I found out via twitter that The Wow Truck was going to be featured on Eat Street, a show about food trucks I had just recently started watching. 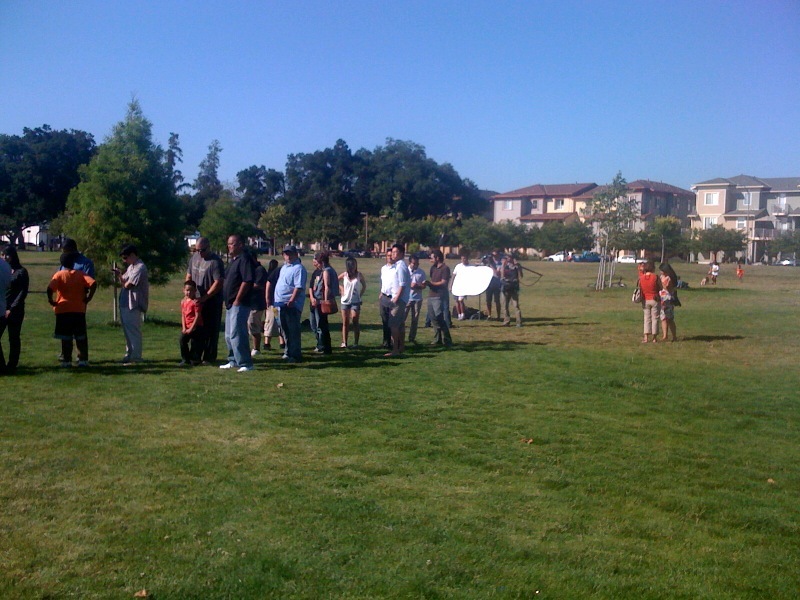 They were filming at Bernal Park with Treatbot serving too. Despite the lack of veg options at the Wow, I thought I’d go check out the scene and grab some Treatbot. I had been to these trucks before at this location, and I had never seen the line so long! 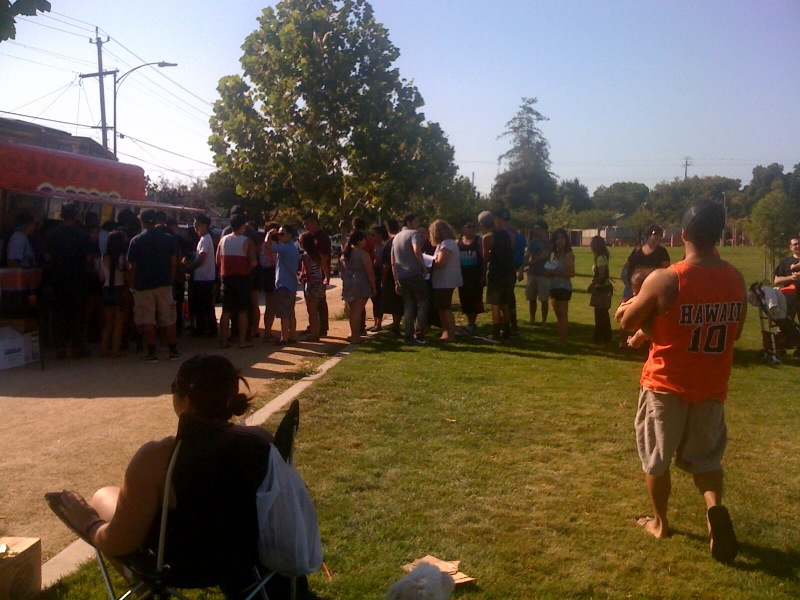 I was kinda glad I was only eating at Treatbot since the line was so long, but it was great to see so much support for a south bay food truck! I was also happy to have an opportunity to eat at a couple trucks before I drove down to LA today. 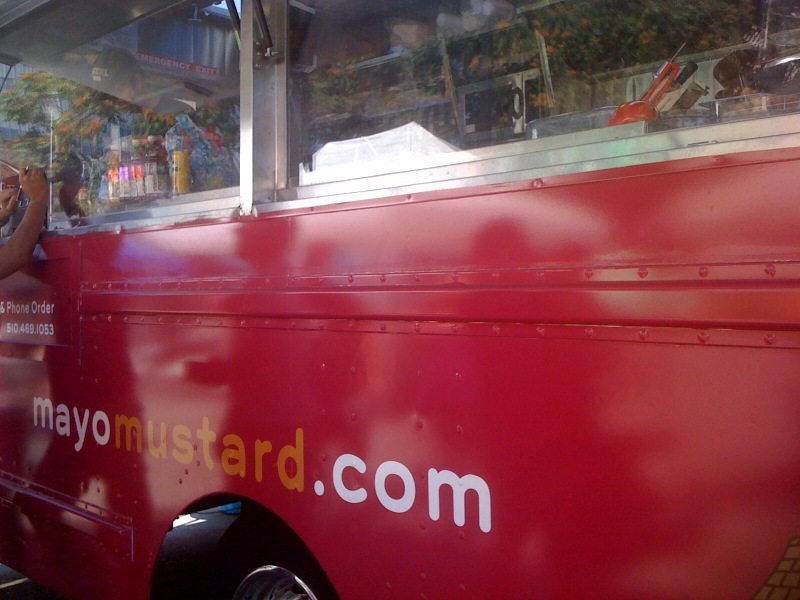 Tomorrow the quest to hit up as many LA food trucks as possible begins!